Welcome to my recap of the second episode of 'All or Nothing: Michigan Wolverines', which can be streamed on Amazon Prime Video. 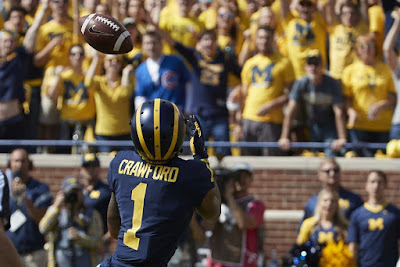 The second episode began with Michigan’s second half comeback powered by an intense speech from defensive coordinator Don Brown at halftime of the Florida game. Assistant coach Pep Hamilton made his way onto the field as time expired to give Speight credit for not packing it in after back-to-back interceptions in the first half and to rally the offense to a win. Wolverines coach Jim Harbaugh added that Florida hopefully learned its lesson by saying it is easier said than done to back up the trash talk. We transition to Harbaugh’s home, where him and his wife, Sarah attempt to feed the kids breakfast. While having breakfast, Katie Harbaugh, daughter of Jim and Sarah appeared to have an ear infection from a prior piercing and is in a bit of discomfort. They go to the Michigan athletic facility as the trainers looked at Sarah’s ear and everything turned out to be okay. Harbaugh met with the team and gave Chase Winovich the defensive player of the week award for his effort against Florida as the first day of classes began on campus. Winovich walked around between classes as some of the students greeted him. Freshmen wide receivers Donovan Peoples-Jones and Tarik Black are shown horsing around on the elevator on the way to their dorm room. Both talked about their similar playing styles and how they view themselves as brothers. Winovich and Black decide to go to the hair salon and barber shop, respectively. Winovich’s trip stood out as he bleached his hair blonde and when he arrived on campus, the coaches and players ribbed him saying he looked like Hannah Montana and a 1970’s wrestler. Michigan’s home opener against Cincinnati became the focus as the families of Winovich, Black and Peoples-Jones are highlighted as they sent their respective players off on the team bus to Michigan Stadium. Despite struggling against Florida with a pair of interceptions which led to touchdowns, Speight remained the starter going into the Cincinnati game. Harbaugh told the team prior to kickoff that the game should be treated like our Super Bowl and to let the nerves go away. The pressure stayed with Peoples-Jones as he delivered a pair of questionable punt returns, which frustrated Harbaugh. Despite the lack of awareness from the freshman, Michigan cruised to a 36-14 win over Cincinnati to move to 2-0 on the season. The next scene follows Speight as he watches his girlfriend, Michigan women’s soccer player Ani Sarkisian in action. Speight talks with his family in the stands about the Cincinnati game and what the freshmen receivers can work on going forward. In the most powerful part of the episode, Rashan Gary and his mother, Jennifer Coney-Shepherd go to Red Lobster for dinner and talk about whether the college experience has changed him. Gary responded by saying he is being himself every day and does not take any time to look at things from an outside perspective. Coney-Shepherd said that Gary has to take time out for himself. To Coney-Shepherd, Gary is just a kid at 19 years old. She mentioned working and going to school full-time, but made time for herself despite being exhausted. Coney-Shepherd emphasized time management as a sticking point. Gary is then asked by his mother whether or not he has spoken to his father. Gary said lack of communication has kept them from talking and talked about how his father would rarely go to his games. Coney-Shepherd said as long as we have one another, that is all that matters as tears were shed on both ends. Despite football being the centered focus in the series, Coney-Shepherd proved to be highlight as the rock behind Gary’s success on the field and in the classroom.